The game was moved up in anticipation of Hurricane Florence, a category 3 storm that is expected to hit the North Carolina coast late Thursday. NORFOLK, Va. -- Old Dominion’s football game at Charlotte, originally scheduled for Saturday night, will instead be played Thursday at 4 p.m. at Jerry Richardson Stadium in Charlotte, officials from both schools announced on Wednesday. ODU coach Bobby Wilder and his team boarded buses for Charlotte Monday afternoon. At that time, ODU and Charlotte officials thought the game would be played Saturday. But the predicted path of Florence has since shifted southward. Moving the game up will allow it to be played under the safest circumstances possible, officials said. Charlotte administrators, including athletic director Mike Hill and coach Brad Lambert, were in close contact with ODU officials. 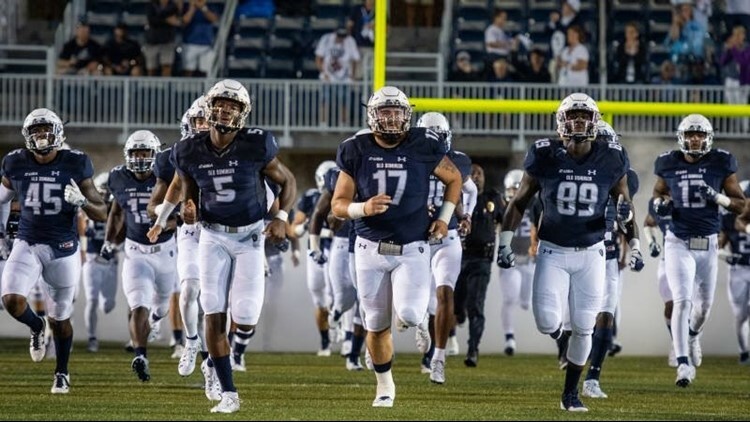 “On behalf of our Old Dominion football program, I want to thank Mike Hill and the Charlotte administration for keeping the safety of our student athletes and fans paramount while working with the league and other officials to ensure this conference match up could be maintained despite challenging and changing inclement weather predictions,” said Dr. Camden Wood Selig, ODU’s athletic director. ODU is 0-2 after having lost at home to FIU last weekend, 28-20, in its Conference USA opener. ODU is the C-USA opener for Charlotte (1-1). ODU is 3-0 against Charlotte and won, 6-0, last season in Norfolk.